Queen Of Riches is a 6 reel, 7 row, 117,649 ways to win slot game with a 96.9% RTP and comes with Wild feature. Queen of Riches – a game with 6 reels and features traditional wilds, stacked symbols and wild reels. This game proves to be one of the best game when talking about features and graphical qualities – it stands out among the others. The online slots game is available on MoneyReels.com. Queen of Riches exhibits Big Time Gaming’s original mega ways feature, which recedes and flows with every symbol that comes up on the reels. The game has an overall theme similar to the settings in ancient Egypt. Big Time Gaming is the developer of Queen of Riches slots, who has a trademark of mega ways feature. Based in Australia and with the license to practice in Canada, Gibraltar and Alderney, Big Time Gaming is strongly devoted to producing online video games, as well as Blackjack and Roulette. What is more, games developed by Big Time Gaming are made available in many languages – over 20 of them. These languages include Russian, Japanese and Chinese. Nik Robinson, the CEO of the software company, has been in the business for more than 20 years. He started out with establishing Tech Media, which he later sold to News Corp (New Corp eventually became Openbet). He then later established another development studio in 2011 known as the Big Time Gaming today! Big Time Gaming has since its inception wowed it lovers with excellent online slots! You may as well as other games produced by Big Time Gaming. Some of these games are Star Quest slot, Viking Quest slots, Gold online slot and Temple Quest. Many symbols are featured in the game, which includes the traditional card symbols with the labels Ace (A) K, Q, J, 10 and 9. Other special symbols in the game are the bluebird, a green eye, and a red eagle. The symbol that gives the highest possible payout in the game is the pyramid dots. The symbol that represents the wild symbol in the game is the Cleopatra. The Cleopatra wild is capable of taking up all the 4 rows on the game’s reels. If you are the type of player that enjoy playing games with the touch and feel of Egypt in them, then Queen of Riches is the game to try out. The game has a number of bonus rounds to show off, in the lieu of connected reels! Queen of Riches is really an attractive video slot that will give players the best possible entertainments. 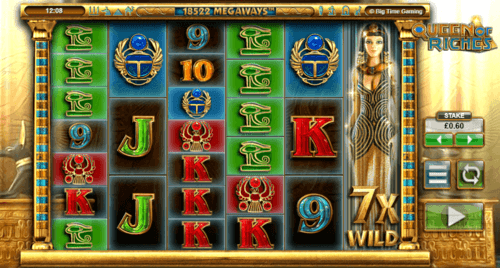 The mega ways feature of the game can build up rapidly such that you will end up having 117,649 ways of winning with the appropriate combinations. The connected reels appear to be the best feature the game has to offer because with the feature, you can have up to 4 identical reels, which could trigger a very huge win. 6 reels are involved in the game, and each of these reels has the possibility of revealing 7 symbols. Let us understand what we mean by each reel having the possibility of revealing 7 symbols. It means that you have up to 117,649 different ways of winning in the game. To begin with, all the wins in the game are achieved when you have 2 or more identical symbols on adjacent reels aligned from left to right, irrespective of their sizes. The reels featured in this game have no definite number of positions the reels can assume. With this feature, it means that from 3 to 7 symbols could possibly appear on each of the reels with each spin. The mega ways feature means that each spin presents the different number of winning possibilities, the highest which could be up to 117,649 ways if the reels stop on a 6 x 7 grid. The Wild Queen: If you aren’t still wowed by the 117,649 ways to win, the game features quite a number of bonus rounds that could help spinners boost their winnings. The wild symbol represented by the Queen of Riches can appear on the 7 positions each reel can assume, and it can replace other symbols to complete a winning combination. In addition to the wild symbol’s ability to replace other symbols, it can also provide multipliers ranging from times 1 (x1) through times 7 (x7). The multipliers can be applied to all the wild winnings created. Furthermore, the wild symbol can even multiply each other. That is, 2 wilds with a maximum of x7 multiplier each can be found, resulting in a multiplier equaling times 49 (x49). Per spin, players can place just 1 wager which will count as the cumulative bet. The coin values you can stake are: 0.2, 0.4, 1.0, 2.0, 4.0, 5.0, 10.0, 20.0, and 40.0. Because there are many ways to win in the game, the prizes in the games may seem very small, but playing several spins will cumulate wins for you. The paytable will provide you with the details about how much you can win based on the coin values selected. Queen of Riches slots by Big Time Gaming is optimized for play on desktop and mobile devices (iOS and Android devices). The game performs well on tablets too.